Web 2.0 has made the daily nuts and bolts of public relations work unrecognizable from a decade ago. Now, every public relations team needs reliable tech tools for media monitoring, instant messaging, task management, and media-list building, just to name a few. 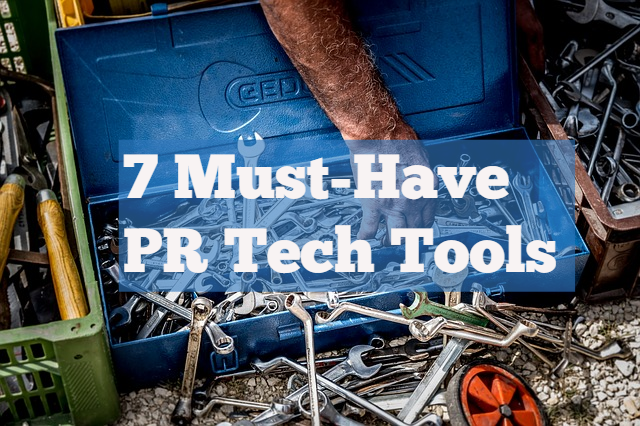 PR people routinely use apps for document design like BeFunky, the industry standard software Cision, and a wire distribution platform like PR Newswire. Some in our agency swear by sanity-preserving apps that have nothing to do with daily business, like Spotify and Calm (for meditation, which we still aspire to!) Apps and web tools come and go like Silicon Valley startups, and the choices can feel endless. Here’s our must-have list. Crenshaw partner Chris Harihar swears that Wunderlist is the next best thing to having an assistant (insider tip: PR people do not typically have dedicated assistants). Wunderlist is pleasing to the eyes, and more user-friendly than Outlook’s “tasks” bar. It’s synced across all devices so it’s readily available to check at all hours of the night (insider tip: PR people work nights). Plus, it allows you to separate work lists from others like travel, chores – whatever the user deems necessary to keep life from spinning into chaos. You can toggle seamlessly your grocery list and the Q4 PR plan. Also, if you’re collaborating on a project with a coworker – as we always are – we can share lists using the app. Cision’s media contact information should never been taken as gospel, since journalists, outlets, and email addresses are constantly in flux. PR pros can verify a reporter’s email address quickly by typing it into the single bar on the website www.mailtester.com. If the contact is elusive but you know the domain, you can test address combinations. Most domains allow access for this type of testing, although a few do not. Mailtester or one of the similar apps like EmailHunter is a lifesaver for most PR people. Techmeme is a favorite news aggregator website for tech PR people. Every pro has her go-to channel for tracking news developments in technology. A quick glance at Techmeme.com or its e-newsletter brings you up to speed on trending conversations from outlets like The Verge, ArsTechnica, and Financial Times – as well as a list of upcoming tech conferences and events. Our own account supervisor Erica Schain says it’s the best place to get a summary in real time of what’s trending across the tech blogs, offering a bird’s eye view of what reporters are writing about. As a bonus, Techmeme launched its own podcast earlier this year, hoping to duplicate the roaring success of The New York Times Daily, a top podcast since 2017. BuzzSumo remains a go-to tool to assist PR pros in keeping track of who’s writing about what topics, and the resulting social engagement from each placement. This tool is key for sniffing out gaps in the narrative that allow PR pros to find the right story angle to pitch. BuzzSumo pro plans allow one to identify influencers’ shared content, find backlink opportunities, and monitor brands and competitors’ content. A quick search returns a list of influencers on any given topic, along with several telling statistics, including domain authority and share percentage. Cost ranges from $79-$499 per month. While heavy hitters like Microsoft (Yammer) are racing to develop applications to compete with Slack, and competitors like BaseCamp and Trello offer solid alternatives, it remains the best option for the Crenshaw Communications team for internal collaboration. We have separate channels set up for each client, and we can swiftly share links, images, and documents. Like many companies, we even have a dedicated channel for non work-related chat, where we might share a ridiculous pop culture story or gossip. Though Slack hasn’t yet unclogged email inboxes, it helps us make things happen faster — an absolute must in the world of New York tech PR. Remote voice and video communication are critical to PR work, from client meetings to media interviews. Every PR agency needs a versatile solution for meetings. UberConference allows for easy connections without pin codes and app downloads, and can be integrated with tools like Slack and LinkedIn. With the UberConference Business upgrade ($15/month), participants from 50 countries can call in. Further, the cloud software allows meeting participants to collaborate on documents during the call. Clearly, one of the great advantages of technology is its improvement of collaboration not only in PR, but all industries. We encourage clients to tell data-driven stories that are mediaworthy and verifiable. Survata is an affordable market research company that advises on and executes surveys using its network of publishers and partnerships with research panels. An SMB can conduct market research with unlimited survey questions at a reasonable cost. We’ve found it a useful resource among the many options for customers surveys and newsmaking B2B opinion research.